Recorded at just under $6 million, the sale of a never-lived-in luxury townhouse at 176 Sunset Ave. has highlighted the appeal of such residences in a market where in-town, low-maintenance living has long been a hot commodity. 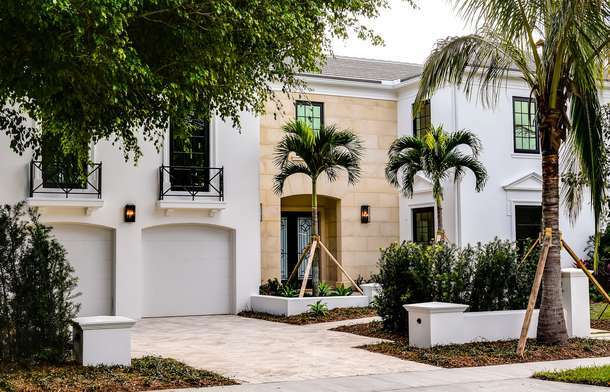 The transaction also appears to have set a record as Palm Beach’s highest-dollar sale of a non-waterfront townhouse, at least among those listed in the local multiple listing service when they sold. With a pair of identical townhouses sharing a common wall, the Sunset Avenue development is one of two brand-new townhouse projects on the market right now. The other development, in Midtown on Brazilian Avenue just west of South County Road, isn’t yet completed. The buyer in the sale recorded May 25 was Dude Holdings LLC, a Delaware limited liability company. The deed links the buyer to Franklin Resources and Franklin Templeton Investments, billionaire Charles Johnson’s company in San Mateo, Calif., for which his son, Greg Johnson, serves as chairman. The elder Johnson and his wife, Dr. Ann L. Johnson, are seasonal Palm Beachers, and the Johnson family has been active in Palm Beach real estate over the past couple of years. In 2013, they were behind the $42 million purchase of a lakefront mansion built on speculation at 1220 S. Ocean Blvd., listed by Corcoran Group agent Jim McCann, with agent Stephen Ploofof Linda A. Gary Real Estate on the buyer’s side. Last December, the Johnsons’ daughter, Holly Bartlett, paid a recorded $7 million for a house at 325 Garden Road. Agent Liza Pulitzer of Brown Harris Stevens represented the buyer of the Georgian-style townhouse on Sunset Avenue. Pulitzer also had acted on behalf of Bartlett in the sale on Garden Road opposite McCann. Pulitzer declined to comment on either sale. The townhouse’s listing agents, Toni Hollis and Gloria Moré of The Fite Group, also aren’t talking. They had listed the four-bedroom unit with 4,724 square feet of living space, inside and out, in September 2014. It’s pre-construction asking price was $6 million, later raised to $6.2 million. The development marked the first new townhouse project developed on speculation in Palm Beach in 13 years. It was spearheaded by seasonal Palm Beachers John Flynn Sr. and his wife, Lee, along with son John Flynn Jr. The family also owns a development company that operates in Ireland and England. The adjacent townhouse at 180 Sunset Ave. also is priced at $6.2 million. Both townhouses have libraries and private lap pools. The development is in the ocean block of Sunset Avenue, north of the landmarked post office building on Royal Poinciana Way. Another MLS-listed townhouse on a non-waterfront lot approached the price of the unit just sold. Last November, MLS shows, a four-bedroom, 5,148-square-foot townhouse at 360 Cocoanut Row sold, with its furnishings, for $5.85 million. The turnkey deal that saw agents Crissy Poorman andMary Boykin, both of Sotheby’s International Realty, on the seller’s side and broker Linda Olsson of Linda R. Olsson Inc. on the buyer’s end. As far as waterfront townhouses go, lakeside unit No. 1 in Villa Plati at 310 Atlantic Ave. on the near North End is in the biggest-dollar leagues. That three-bedroom, 5,658-square-foot unit changed hands, off-market, in May for a recorded $6.975 million. Broker Lawrence Moens ofLawrence A. Moens Associates handled both sides of the deal. When the unit had sold previously, for $5.75 million in 2012, Moens had acted for the buyer side opposite listing brokerLinda Gary of Linda A. Gary Real Estate. And in a sale recorded in 2007, a lakefront townhouse at 452 Brazilian Ave., facing the Town Docks, sold for $6 million, co-listed by Gary Little and Paul J. Birmingham, then of the Corcoran Group but today affiliated with The Fite Group. On the seller’s side of that three-story, five-bedroom unit with 6,744 total square feet was agent Pamela Terracona, who was then with Linda A. Gary. Although the beachfront Las Ventanas development, which faces South Ocean Boulevard on Gulfstream Road, is technically a two-unit condominium, its shared-wall design resembles a townhouse project. The building’s highest-dollar sale was an $8 million deal in 2012 for a 7,700-square-foot unit at 104 Gulfstream Road, handled on both sides by broker Christian J. Angle ofChristian Angle Real Estate. The other Las Ventanas unit, at 102 Gulfstream, sold for $7.65 million in 2014, with Corcoran agents Dana Koch and Paulette Koch on the seller’s side opposite agent Asha Radtke ofSotheby’s International Realty. The 6,531-square-foot unit had sold new in 2011 for $5.7 million, listed at the time by McCann, with Dana Koch on the buyer’s side. Less than a mile away from Las Ventanas, construction is progressing at Palazzo Villas, an ultra-luxury development of four townhouses being developed on speculation at 215 Brazilian Ave., just west of South County Road, reports listing agent Chris Deitz of The Fite Group. Those units are larger than the ones on Sunset Avenue, with five bedrooms and about 6,100 total square feet each. Two are priced at $7.795 million and the others at $7.195 million. MLS shows one of the less-expensive units under contract, but Deitz said contracts are pending for two more. The developer is a joint partnership that includes Brian J. Mylett’s Capital Development Group International Inc. and builder Josh McAlees. The development, which broke ground last October, could be ready for occupancy as early as the first week in September, Deitz added.